Steve, the kids and I left the farm for 2 & 1/2 days to tour colleges in Minnesota. It has been ten years since all four of us have left the farm overnight during the growing season. Most years, I take the kids to visit family for a week in early August. Ten years ago, we talked Steve into coming with us for part of the trip. It was stressful and hectic and we haven’t tried it since. We were able to go to Minnesota because of our wonderful crew. We left a short list of instructions and called a few times each day. I can text during a college tour – that’s not hard! Anyway, we are very grateful for how everyone stepped up so we could go. Special thanks to Maggie, Simone, Kerry, Jon, and Billy. I hesitate to credit people by name because everyone pitched in. Steve is in the thick of establishing our storage carrots, which complicated our trip. Early to mid-July is the time of year to plant carrots for fall harvest and winter storage. Carrot seedlings are tiny and fragile, and establishing each field takes many steps. Steve worked right up until we left, with the last moments spent planting carrots. (We plant a sequence of seven to nine fields each year.) New carrot seedings need irrigation or rain most days for 12 days after planting. It rained early Sunday morning, then we jumped in the car and drove west. How perfect. Within ten minutes of our return Tuesday night, Steve was on a tractor and hitching up irrigation. – The fall before, plant a rye and vetch cover crop. – In June, mow the lush rye and vetch growth, then till it into the ground. – Soil preparation involves multiple steps. Steve continues to tinker with the best sequence for field prep. – Plant the carrot seeds. – Irrigate every day for 12 days. – Flame weed the carrots. Steve draws a set of LP burners over the carrot rows, flaming a strip where he planted the carrot seeds. The weeds shrivel and the carrots emerge unharmed in a day or two. This step saves a remarkable amount of weeding. – Soon we will cultivate the fields by tractor and weed by hand twice. Harvest begins in October and will be completed by mid-November. Steve flame-weeds a carrot field. Tiny weeds have emerged but the carrot seedlings are still safe underground. That’s the perfect time to flame. There are a lot of ‘splits’ in this week’s box. See the last two lines of my list below. Tomatoes and eggplant are just getting started. Soon, the harvests will increase and we will be swimming in tomatoes, peppers and other summer crops. The melons are very, very close to ripening. Maybe next week? Maybe the following week? We decided to send two types of onions this week, to give you flexibility. We continue to send sweet Walla Walla onions but have added one big white onion so you also have an onion suitable for frying. An extra handful of beans OR 1-2 tomatoes OR Japanese eggplant OR a small kohlrabi OR an extra mini cabbage. Next week’s box will probably contain sweet corn, snap peas, zucchini, cucumbers, onions, tomatoes, an herb and more. ‘Caraflex’ cabbage – This is the same type of cabbage that we sent three weeks ago. Tender, crunchy, they are great for cole slaw and summer salads. Sweet corn – We have just a few ears this week, as the field gets going. Most are on the young side. Personally, that’s my favorite stage. More will be ready next week. Cucumbers – We will pack a mix of #1 and #2 grade cucumbers. The #2 grade cucumbers have scarring from wind damage, or are small. The bees are less active in hot weather and don’t spend as much time pollinating and we end up with some smaller cukes. White onion & Walla Walla onion – You can distinguish these onions by their color. White onions are white. Walla Wallas are white to yellowish, with loose outer skins. See photos. They have distinct uses. Wallas are sweet onions – great for salads, or grilled kebobs, or added to dishes near the end of cooking. White onions are much more pungent and will fry better than Wallas. Pan-fry the white onion with your peppers and zucchini and basil for an tasty combination. Let’s face it; these early onions will have some soil attached. We harvest them as fresh onions. The outer roots and skins don’t have time to dry for easy removal. A quick wipe will clean them up. Storage: Both Wallas and white onions are best refrigerated at this time of year. Basils – We will pack two types of basil this week. See photo. Thai Magic is the the same licorice-scented basil we sent last week. Eleonora is an Italian basil. White onion (left) and two Walla Walla onions (right). Note the light yellow color and loose skins of the Wallas. Thai Magic basil (left) and Italian basil (right). Both will be in the box this week. I had something like this at the Willy Street Co-op once and just couldn’t get the perfect combination of corn and cabbage out of my mind for months. This coleslaw is exactly what your summer table needs! Bring a large pot of salted water to boil. Fill a large bowl with ice water and set aside. Add corn to the boiling water. Boil for 1 minute. Drain, quickly rinse under cold water to stop the cooking process. Continue rinsing until corn feels cool to the touch. Using a knife, cut the corn off the cob. Learn a great technique here! In a large bowl combine the corn, cabbage, and onion. In a small bowl, whisk together the mayonnaise, chili powder, oregano, cumin, cayenne, lime juice, mustard, honey, salt, and pepper. Pour the dressing over the cabbage mixture and toss to coat. Chill and serve. As usual, this recipe is very versatile. You could just make the zucchini pizza crust and top it with whatever you like (pizza sauce, pepperoni and mozzarella for example) or you can go totally vegetarian as I did and top it with CSA ingredients. I used pesto for the sauce because we always have pesto in our fridge in the summertime, but feel free to use any pizza sauce that you have on hand! Preheat oven to 525 degrees. Place baking stone, pizza pan or baking sheet you plan to bake pizza on in oven while it preheats. (Allow the pan to get really hot will help keep the pizza crust from sticking). Combine shredded zucchini and 1 teaspoon Kosher salt in medium bowl and let sit for 15 minutes. Wrap shredded zucchini in cheese cloth and squeeze until no water remains. 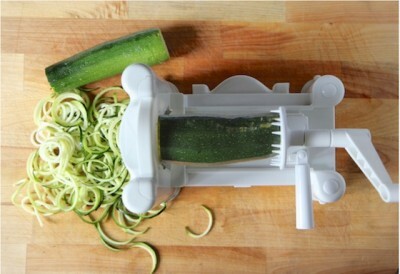 This should take about 5 minutes as there is a lot of water in large zucchini. It’s important to get the majority of the water out to ensure a crispy (not soggy) crust! Combine the shredded zucchini, flour, 1/2 cup Gouda, garlic powder, oregano, basil and egg in a clean medium bowl. Stir ingredients together until mostly incorporated and then use your hands to make mixture smooth and even. Turn mixture out onto a piece of parchment paper. Press with your hands into a 10-inch circle about a 1/2-inch thick (or another shape if you don’t have a round baking pan). Remove baking stone, pizza pan or baking sheet from the oven and slide parchment (and crust) onto it. Place crust in oven and bake for 15 minutes until golden brown all over. Remove and let cool for 5 minutes. Meanwhile, prepare topping. Heat 1 tablespoon olive oil in a large skillet over medium heat. Add onion, 1/2 teaspoon Kosher salt and freshly ground black pepper. Reduce heat to medium low and cook for 10 minutes until well-softened and fragrant. Add remaining olive oil, bell pepper, summer squash, remaining Kosher salt and more freshly ground black pepper. Add a tablespoon water to the pan if things are sticking. Cook for additional 15 minutes. Set aside until ready to use. Once pizza crust has been allowed to cool, flip it so that golden brown side is down on the baking pan. Remove from parchment (use a spatula if it doesn’t come off easily). Top with sauce, followed by cooked veggies, then a handful of fresh basil leaves and remaining Gouda. Bake 10-15 minutes until pizza is cooked through and cheese is golden. You must be searching out colleges for a young student. Check out St. Olaf in Northfield. I went there and just went to my 50th reunion. The same music magic still exists.